As I browsed through our albums last weekend , looking for pictures that we could use for Ms. Burrito's project, I discovered that I did not have any single copy of that last vacation that we took back in South Korea. It's a bummer but I am glad that we still have the copies of photos in our computer. So before our PC crashes, I will be ordering hard copies for those photos online so we could preserve the memories! Below is just one of so many photos I took during our getaway. Our kids are still little on this photo. We all miss our fun time together in the land of the morning calm. There are so many things to do in there especially in the beach. We live so far from the beach over here. The first and last time that we have been in the beach ever since I came here was 5 years ago. We went to Pensacola Florida, it was a great travel! I just now realize how I neglected to appreciate what we have when I was growing up. We live in the coastal area of the Philippines so swimming in the ocean is just part of our daily activities. Now that we don't have it here, I miss it a lot! Don't this look like a painting almost? That's the color of the sky last weekend! wow..the view is just breathtaking! Great shots both of them. The first one is lovely with those cute children of yours (I guess) and the second one is awesome, with the pinky and cloudy tone. Congratulations and have a great weekend too. The Philippines must be a great country! Thanks for sharing. Have a great weekend Rose. Wonderful shots from the beautiful beach. Your little ones are so cute! 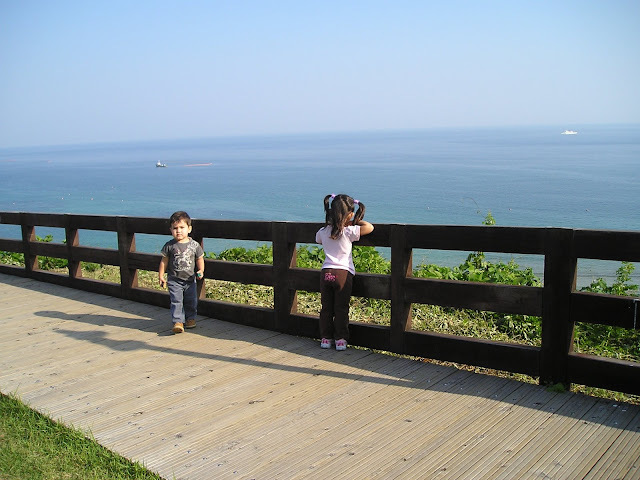 The picture of them by the sea is enchanting! Beautiful photos. The first one was so great. The one of the children by the sea, is just the sweetest ever. Lovely views of the sky. So serene and gorgeous. Ms. Burrito's shadow is hidden in the shadow from the fence! The colors in that sky in the lower picture are gorgeous! Beautiful sea view in the first photo! Like a glimpse of forever! And delightful sky colours in the second! Beautiful sky. I love when the sky is full of color!